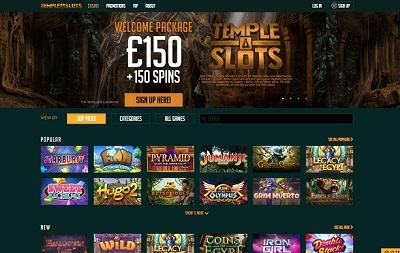 Temple Slots is licensed by the UK Gambling Commission and the Malta Gaming Authority and has a live chat and e-mail service for any problems that may occur. Yeah, I really like this, it’s got an excellent feel to it: Lovely typeface, lovely logo, lovely colour scheme, lovely imagery. Yep, an all round good job here, you can almost tell that from just when you land on the page, to be honest. The navigational journey’s excellent too, with all the menu buttons immediately obvious as soon as you land on the page. There’s also a handy little slideout bar at the bottom so you can contact the support team right away. A fantastic job in every department. 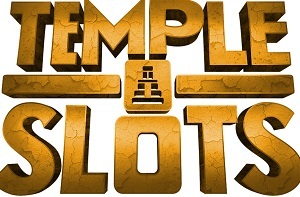 Temple Slots offer most of the popular payment methods including Visa, Mastercard, PayPal, Neteller, and Skrill. The minimum deposit is £10 and there is no deposit limit. There is no minimum withdrawal or withdrawal limit. You may have already noticed from above that Temple Slots don’t offer the widest array of games in the world, but I always think the quantity of games is overrated. Like, you’re not really going to plough your way through over 500 games, are you? You just want good games, really. And Temple Slots do offer good games. In abundance. We’ve got all the favourite slot games like Starburst, Gonzo’s Quest and Aloho Cluster Pays then on top of that we’ve got a lovely selection of progressive slots like Divine Fortune, a whole host of table games, some live casino, then we’ve got video poker and arcade games too! Quality > quantity. Temple Slots has burst out from the traps faster than Maurice Green (I would say Usain Bolt, but he was a notoriously slow starter) in his prime to produce one of the go-to casinos on the internet today. Offering a wonderful user experience including a near-perfect navigational journey, beautiful aesthetics, all the popular payment methods, a great selection of games, and a pretty decent welcome bonus; this casino has everything you could ask for from a new starter. And there’s no doubt about it, this place is going to really shake up the scene, there is nothing assurer. It’s honestly that good.